The article provides facts and information about Navajo land. The Native Americans including the Navajo tribe had never developed a system of private land ownership like the European settlers. 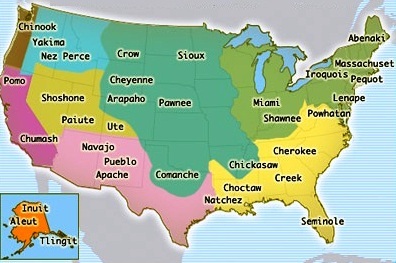 Native Indian land was not owned by individuals. It could not be sold. Navajo land therefore belonged to the whole community. But there were tribal boundaries. Navajo land was recognised by the settlement of the tribe within the boundaries of their territory. The Navajo (also spelled Navaho) originally inhabited the Southwestern United States and are now the second largest Native American tribe of Northern America. The Navajo Land that was home to the tribe, is indicated on the Southwest Indian Land Map, which was occupied by the Navajo before the arrival of the Europeans. The Navajo had never experienced the way of the Europeans especially in relation to the subject of Land Ownership. 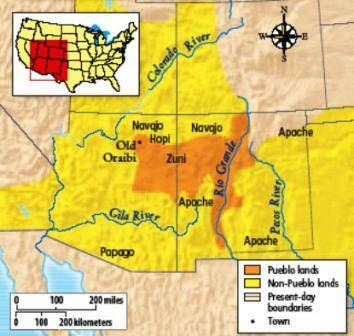 The ownership of Navajo land became the source of the bitter conflicts between the white European settlers, the U.S. and the Native American Indians. The Navajo Native Americans lived in harmony with the land which was emphasized by the their culture, religion and beliefs. The idea of an individual person having exclusive use of a particular piece of land was completely alien to Native Americans. The Navajo fought, as communities, with other tribes over hunting rights to their territory. But the "right" to the land was very different from the legal terms understood by the white settlers relating to individual ownership. The Navajo Indians had no concept of "private property," as applied to the land, but were soon to experience this European idea, through the constant encroachment on the tribal territories and Navajo land. The Navajo joined forces with the Pueblo tribe and forced the Spaniards out of the area following the Pueblo Revolt of 1680. 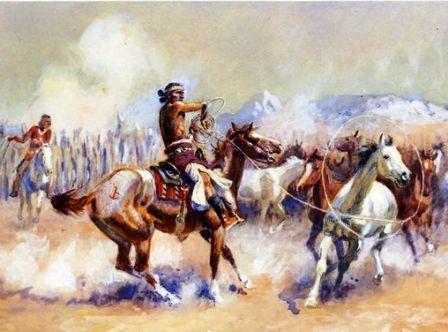 In the 1780s, the Spanish sent military expeditions against the Navajo. The American Indian Wars is the name used in the United States to describe a series of wars, battles and conflicts between American settlers or the U.S. army, and the Native American Indians before and after the American Revolutionary War. In the 1840s the United States Army arrived in the area during the Mexican American War. There were many conflicts between the Navajo and the US. Treaties were made and then broken. The Navajo conflicts continued until Colonel Kit Carson conducted an expedition into Navajo land and receive their surrender on July 20, 1863. Starting in the spring of 1864, around 9,000 Navajo men, women and children were forced on 'The Long Walk' of over 300 miles (480 km) to a reservation at Fort Sumner in New Mexico. The Dawes General Allotment Act was passed by Congress in 1887 which led to the break up of the large Indian Reservations and the sale of Indian lands, including Navajo lands to white settlers. The Navajo Native Indians, together with the other Native American tribes, were removed from their land and sent to inhospitable reservations. Navajo Land. Discover the vast selection of pictures and videos of Native Indians. The pictures show the clothing, weapons and decorations that can be used as a really useful educational resource for kids and children of all ages. Our series of videos enable fast access to the images, pics, paintings and pictures together with information and many facts. We hope that this article on Navajo Land will assist in your studies or homework and that you will enjoy watching the videos featuring many pictures of the Native Indians. A great educational resource for kids on the subject of Native American Indians including the Navajo tribe.